UNIVERSITY of Perpetual Help head coach Macky Cariño believes that the Lady Altas still have what it takes to bring home the NCAA Season 94 women’s volleyball championship. Despite falling short of a comeback against Arellano in a five-set Game Two loss on Friday, Cariño entered the press room of the Arena in San Juan with optimism that they can win the do-or-die Game Three and complete the Cinderella story of the fourth seed Lady Altas. “Akala niyo ba malulungkot ako? Hindi ako malulungkot kasi naniniwala pa rin ako na mananalo kami,” said the strong-willed miracle worker coach after the 25-23, 9-25, 18-25, 25-22, 12-15 loss in Game Two. After a lethargic performance in the second and third sets that put them at a 1-2 match disadvantage, the Lady Altas recovered in the fourth set and forced a decider only for the Lady Chiefs, led by MVP Necole Ebuen, to prevail in the endgame to force a rubber match on Tuesday. 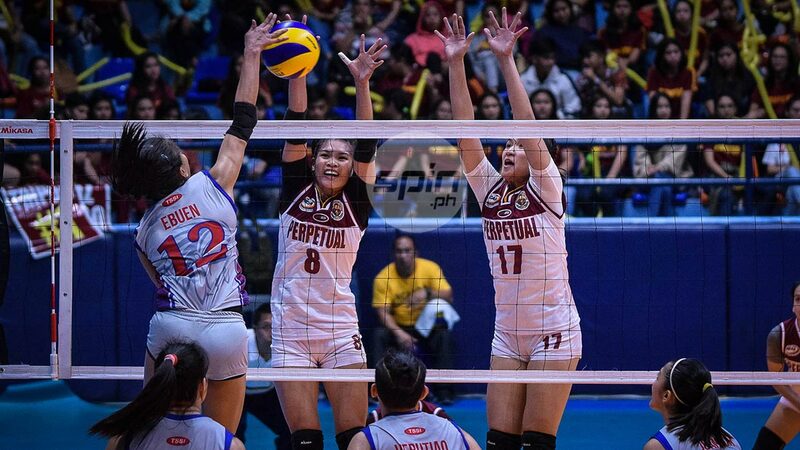 It could have been a triple championship celebration for Perpetual Help as the Altas and Junior Altas completed a perfect season in their respective divisions only for the Lady Altas to be spoiled by the Lady Chiefs. What has been a demoralizing defeat, heads and tears down, but Cariño fed her girls with positivity in the dugout. "In-encourage ko nalang na still five setter pa rin yung game. Sabi ko sa kanila na ang laki ng tyansa pa rin nating mag-champion,” he said. “Binigay yan sa atin, binigyan tayo ng matinding test doon tayo sanay sa matinding test." Led by Cindy Imbo’s 18-point effort, Cariño was impressed with the heart and attitude of his wards, especially in the fourth set comeback from a 12-17 deficit. But he thought that fear hounded them from completing a comeback as their four-game winning streak — two do-or-die games in the eliminations and two from the twice-to-beat top placer College of Saint Benilde in the Final Four. "Takot,” Cariño said. “Kapag pinasukan niyo ng takot yung ginagawa niyo, dalawa lang pupuntahan non e, either magkakamali ka or hindi mo magagawa yung task mo." As everything goes all-out in a winner-take-all Game 3 on Tuesday, Cariño will enter a familiar situation when he won the maiden title for St. Benilde three years ago slaying the thrice-to-beat Grethcel Soltones and the San Sebastian Lady Stags. In their fifth and last do-or-die game of the season, Cariño hopes that his magic will work for Perpetual this time as it seeks to end its five-year title drought. "Siguro destiny na ako ganyan,” Cariño said. “Kung sino nalang yung may malaking puso, kung sino nalang yung magpapakamatay sa bola on Tuesday. Yun siguro ang bibiyayaan ng Diyos."